[ Dr Hugh Wynne of Tynllwydan. ] Autograph Letter Signed ('Hugh Wynne') to his a brother cleric, regarding his indisposition, and making Good ye. service I intended you'. Tynllwydan [ Wales ]. 17 May <1709>. On one side of an 11.5 x 15 cm piece of paper. In good condition, on lightly-aged paper, but trimmed at foot, cropping the lower part of signature and year. He is 'concern'd to hear' of his brother's illness, and would have visited him, had he not himself been labouring under a 'fit of ye cold since my retun to ye Country'. He intends to go to Llanfochell at the end of the week, and to send one of his curates to 'make Good yr. service I intended you in my own person'. [Manuscript; Salisbury; New Sarum] "Com Wiltess" [County of Wiltshire]. Ancient Rents of the principal impropriations of the Dean & Chapter of Sarum [Salisbury]. Five pages, cr.8vo, poor condition, including one bifolium, chipped with small loss of text. On [p.4] of the bifilium there is a signed statement in William Collins's hand (the auditor): 'Theise are the Auntient Rentes of the principall Impropriations of the Deane & Chapter of Sarum (i.e. Salisbury) according to the survey 26 H. 8 (i.e. of the 26th year of Henry VIII = 1534-5). What sume they are improved appeareth not but neither are the values of Bedwym (Bedwyn), Okborne (Ogbourne) & Uphaven (Upavon) expressed.Wm Collins, Auditor'. [Printed booklet in 'Laurie's Kensington Series.'] A Scheme of Moral Instruction For Teachers in Public Elementary Schools. 57 + pp., 12mo. In green quarter-binding, with cloth spine and paper boards, with title printed on front board. In good condition, lightly-aged, with shelfmark, stamps and label of the Board of Education Reference Library, London. The only copy of this second edition on COPAC or OCLC WorldCat at the British Library. Typed Letter Signed ('Salisbury') to 'Miss Niggeman', responding to her comments on 'the Showing of the House at Hatfield'. 5 April 1948; on embossed House of Lords letterhead. 4to, 3 pp. 42 lines of text. Good, on aged paper. He is sorry not to have known about Niggeman's bank holiday visit to Hatfield House: 'it would have been an immense pleasure to us all to see you. Do come down and pay us a private call some other time.' The 'points' she makes 'are just the kind of thing we want to know'. Salisbury did not 'go round the Hosue with the visitors, for I did not wish to embarrass the guides; but clearly there is a good deal more organisation needed before our machinery works smoothly'. 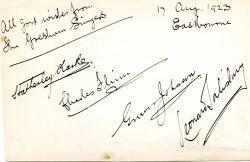 The autographs of the four members of the Gresham Singers. On a leaf (roughly 11 x 17 cm) removed from an autograph album. Good, on lightly spotted paper. Reads 'All good wishes from The Gresham Singers | 17 Aug. 1923 | Eastbourne | Hatherley Clarke | Charles Flinn | Greeves Johnson | Leonard Salisbury'. 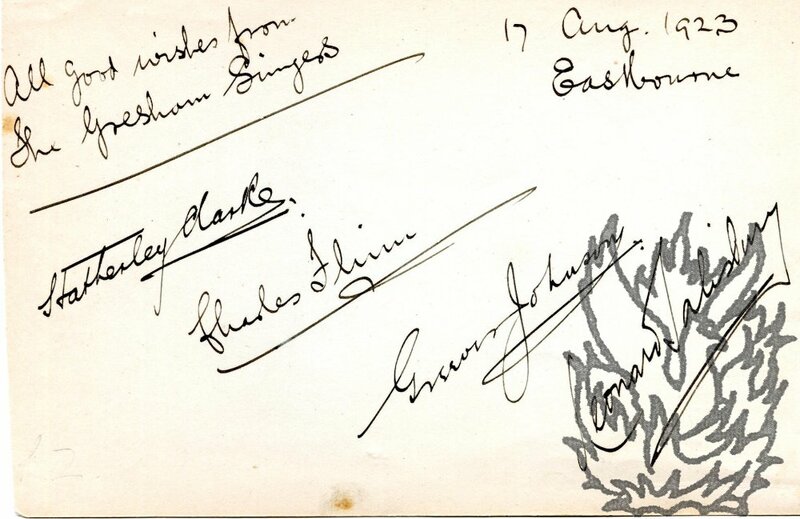 Signature of 'Arnold Stoker | 7/3/1919' on reverse. Stoker was winner of the Guildhall Gold Medal in 1919. Autograph Letter Signed ('Frank O. Salisbury') to 'Our most dear friends' [Mr and Mrs Holiday, perhaps Henry George Alexander Holiday?]. 1 December 1920; on letterhead of 62 Avenue Road, Regent's Park, London N.W. Autograph Letter Signed ('Frank O. Salisbury') to Mrs Shirley Slocombe. 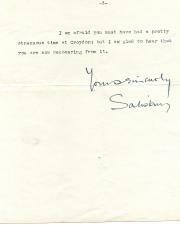 17 May 1936; on letterhead of Sarum Close, West Heath Road, Hampstead, London, N.W.3. 8vo, 1 p, 14 lines. On lightly aged paper, with 9 cm closed tear (affecting a few words, but not the signature) neatly repaired on reverse with archival tape. A letter of condolence on the death of Mrs Slocombe's husband, 'after his long illness'. Salisbury is 'sure he must have had a very courageous spirit to the end - I remember it so well at the Academy Schools'. He suggests a firm that might be willing to buy 'the canvases etc you mention'. The letter links two artists who studied together at the Royal Academy Schools, and also establishes the date of Slocombe's death as 1906. Autograph Letter Signed to Major General Rooke. Learned ecclesiastic (1721-1807), who opposed Hume and edited Clarendon. One page, quarto. Good, though on discoloured paper and heavily creased with a few small holes (not affecting text) caused by wear. Second leaf of bifoliate, damaged, discoloured and with some loss through breaking of wafer; bears address ('To / Major General Rooke | Member of Parliament | Woodstock | Oxfordshire') and postmark 'WINDSOR'. 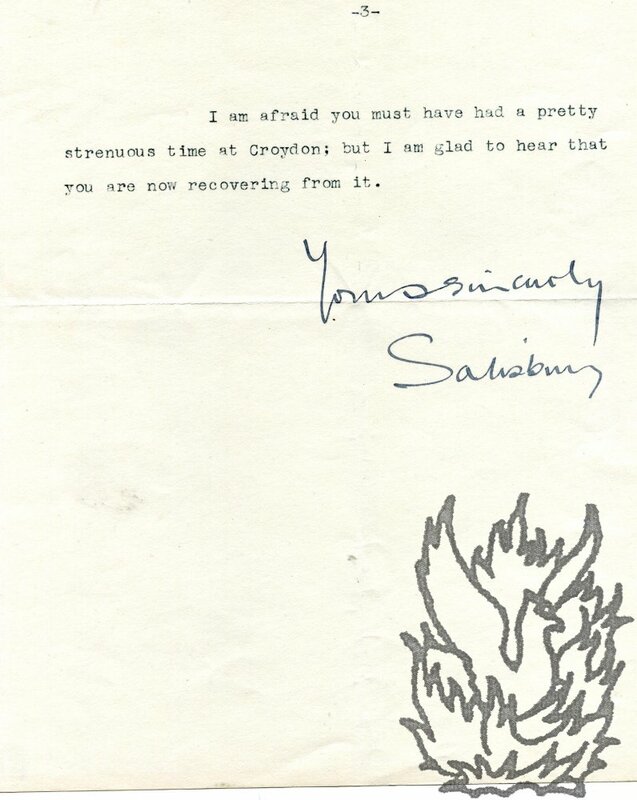 As Douglas was travelling to Salisbury, Rooke's covering letter did not arrive with 'Dr.